Strong hip muscles stabilise your pelvis during the running stride, making it more efficient and reducing the risk of injuries in your back, hips and knees. We spend more and more time sitting, at work, in the car and at home, which can lead to an imbalance in the muscles supporting our hips. There are a large number of muscles around your hip. The exercises here will help you to increase the strength in the key muscles as well as improve flexibility and balance. Improving your balance increases the efficiency of your running stride and helps stop you falling over should you trip. It’s important to warm up before every workout to prevent injury. Run on the spot for one minute. Sit down on a chair and stand up 10 times. Women’s Running is your dedicated running coach, whether you’re embarking on your fifth marathon or you’re lacing up your trainers for the first time. 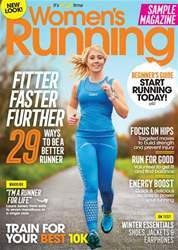 With a fresh new look and a dedicated section for beginners, we aim to bring our running tribe together, and to enthuse all runners with inspiring features and invaluable advice. Check it out in our FREE 16-page sample magazine. Volunteering Step up, feel good!